A few weeks before Easter, I applied to be on my favorite author's book launch team. Applying, I had no idea what the book was called, I had no idea what the book was about. 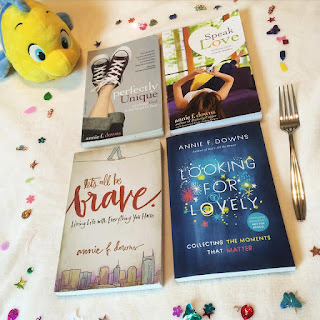 A few days later, I was accepted for Annie F. Downs' book launch team...And the book we'd be launching? Looking for Lovely: Collecting the Moments that Matter. Soon after being accepted to the team, I began reading Annie's book. Soaking up every word, I scoured each page and pressed the messages found between the two covers into my heart. I put adulting off for 24 hours, just so I could focus on the book and the message within it. 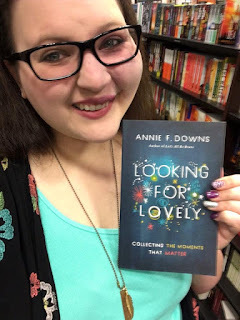 In Looking for Lovely, Annie shares about some recent, personal struggles and pains - and how she found lovely moments in-between the struggle. She puts it perfectly in the video above, "I started to realize that if I wanted to get to the breakthrough from the break down, I had to find reasons not to give up along the way...And those were these little, lovely, moments." The book was an amazing read, and just what I needed...Yet, that idea of lovely, hidden beneath the surface, became all the more real as Easter approached. On Easter, I spent time with my family - including two 1-year-olds (Madison and Erica) and one 5-year-old (Rayna). Madison and Erica, while just a few months apart, had different levels of understanding on the whole Easter egg hunt tradition. Erica is the older of the two. Like the trained pro she is, confidently picked up each egg, opening each one, looking inside for expected pieces candy. Madison, just a few months younger, had to be guided to search for the eggs, still not realizing that beyond the lovely outer shell of the egg, there were more lovely things within the shell. She was constantly reminded by her father, "You get to put this in your basket - this egg is yours to keep." And upon encouragement and being reminded that she was allowed to take and embrace the lovely eggs as her own, Madison held onto the vibrant, plastic, egg, savoring the sweetness it entailed. Rayna, at age 5, knows the Easter routine. And now that there were two younger children in the family? Not only did she get to hunt for Easter eggs, but she also had the chance to hide them for the younger children as well. While Rayna was excited to hunt for the eggs, she was overjoyed to have the chance to hide them, helping the younger kids search for them when they walked outside. Watching the traditional Easter celebration take place in front of me, Annie's book came to my mind. It's important to look for the daily, little lovely things in life. It's also important to create our own lovely moments, treating ourselves to our favorite meal or waking up in time to see a beautiful sunrise. Sometimes, however, we forget to take the time to do so. Or, once we hit adulthood, we get caught up in the hardships and stressors of life, forgetting to embrace the beauty in the smaller lovely things, forgetting to celebrate the joys a simple piece of chocolate can bring our way. Children are great at finding the lovely things. Watch any child on the playground and it's evident that they're pros in the matter. What adults see as a weed, a child often sees a beautiful, yellow, flower. Working at an elementary school, I once had a 7-year-old run up to me with dirty beads in their hands. As they handed them to me, I found myself asking, "Why are they handing me a pile of dusty beads from a broken necklace? Why aren't they just throwing them into the trash?" But then, their words broke my thought process, "Ms. Crystal! Look at what I found! Aren't they beautiful? These are for you." What I saw as trash, they saw as lovely. They saw it as a gift to share with others, while I forgot to look past the dusty exterior. And on Easter? At first, we're taught and guided to look for the Easter eggs, reminded to look inside to find the egg's contents, because there's so much more depth to the hollow egg. We just have to look a little closer, just like I had to look beyond the dirt layer on the beads. But, once we have the hang of things, we get excited for each egg we find, opening each and every one, like my cousin Erica. 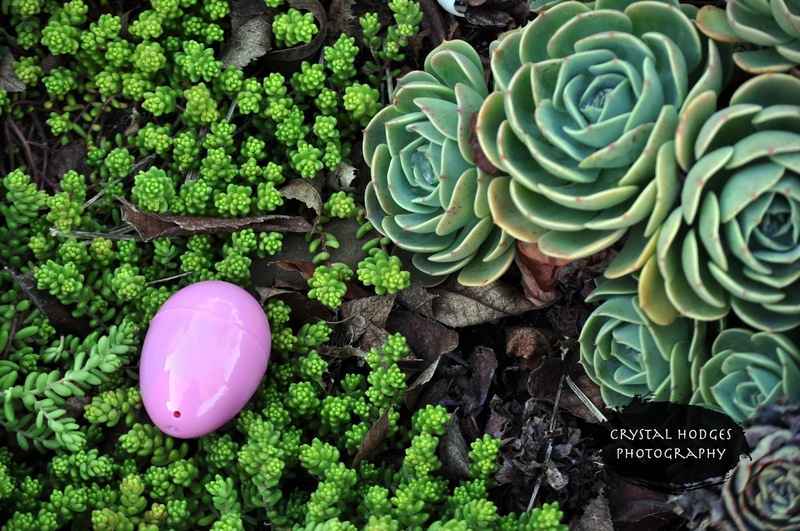 Watching Rayna filled with excitement, dancing across the front yard, hiding eggs for the younger kids, it dawned on me...It's important to look for daily, lovely things...But it's also important to plant lovely things for others to find as well. Whenever I receive a piece of snail mail, my heart gets all kinds of happy. A letter or a postcard brightens my whole entire week, just knowing someone thought of me and took the time to send the piece of mail my way. Yet, to find the lovely note in the mail, someone had to write it, they had to send it. They had to take the time create the moment. When I am stressed or am having a bad day, I often find myself in the kitchen baking a batch of cookies, cake, or making my signature truffles. The next day, I take whatever I bake to school or to work, hoping to encourage others around me - hoping to add a little sweetness to their day. When I share the baked goods with others, seeing their faces light up and I realize the impact one cookie can make, a bit of unintentional loveliness is often added in my own life. The girl who has everything?" While we need to look for lovely things and lovely moments in our own lives, the power of adding lovely moments in the lives of others is undeniable. In the midst of a chaotic life, we need to remember to take time to place Easter egg moments in the lives of others, filling them with chocolate, moments of laughter, or words of encouragement. When you pick up this book, make sure you have on comfortable pants for all the laughter, and a box of tissues by your side to help catch your tears of healing. 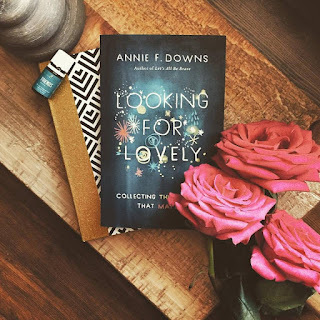 In Looking for Lovely, Annie transparently takes you through some of her hard and beautiful life moments - sharing her insight and wisdom on finding daily, lovely things, regardless of her life's surroundings...Which is a life-changing skill once we learn and remember to find our own daily, lovely moments. 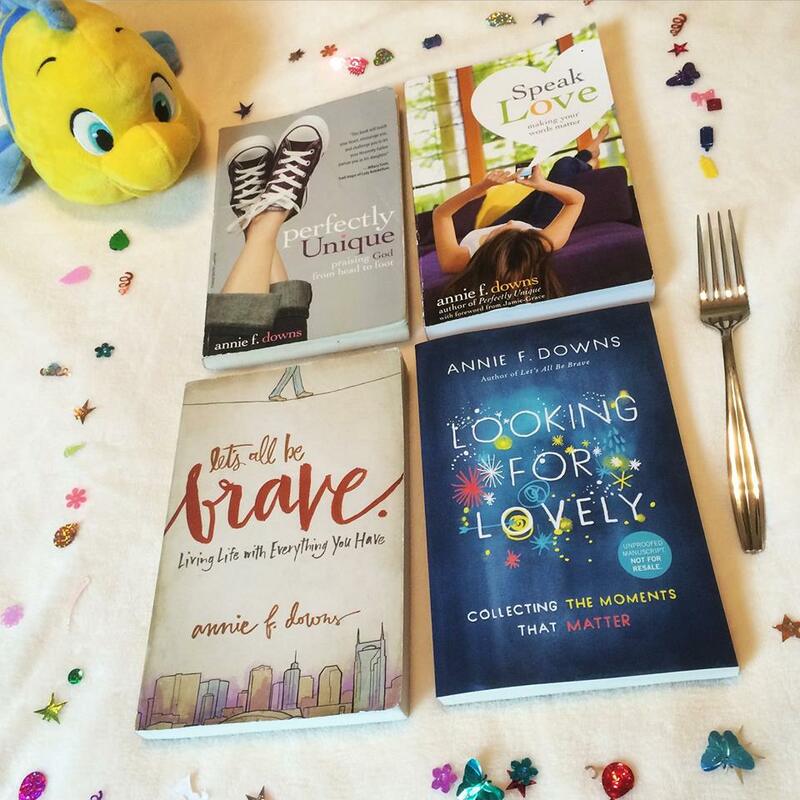 Annie will instantly become your best friend as your flip through the pages between the covers. I read Looking for Lovely in less than 24 hours, and was ready to read it again when I finished the last chapter.